Are you ready for some FOOTBALL?! I certainly am! Mainly because I’m ready for some Super Bowl Recipes. These Super Bowl appetizers are sure to make your guests ready to enjoy the big game. We have everything from finger foods to the perfect sliders. Whoo Hoo!! Thanks Jenny for including my Sausage Jalapeño Pepper Poppers and my Buffalo Wings in this line up! We loved both of your recipes Evelyn. So glad you join in Whimsy Wednesdays each week! Thanks so much for featuring my Pesto and Bacon Pizza Appetizers! They are absolutely gorgeous Nancy. You are so welcome! 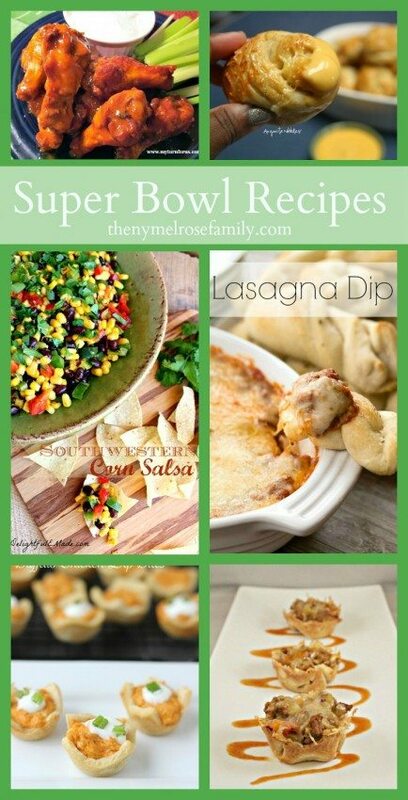 The lasagna dip totally caught my eye when I saw this pic posted on Google+ – just as I was thinking about apps to make for the big game next weekend. Perfect timing. THANKS! The lasagna dip is definitely to die for Carrie. That’s from I Heart Eating and Kate makes me drool on a regular basis. Everything on your list looks SO delicious!!! Thank you for including my Cheesy Prosciutto and Spinach Wontons! So glad so see them in such a great line up! Blessings to you!! I am pinning and tweeting these delicious finds! We adore wontons at our hose Diane so those will be a huge hit. Thank you for sharing! I should not have read this on an empty stomach!! I love Super Bowl food. I don’t really care about the game (especially this year) or the commercials (even though they are fun). I really just love an excuse to eat yummy snack-y food for dinner and get away with it!! Your pretzel bites were one of the first ones that caught my eye Anyonila. Thanks so much for joining in! Thanks so much for joining in Erin. I always look forward to your posts. Yes! I agree! This is a great RoundUp review. You are so welcome Zainab. I love bite size portions. Oh yum, Jenny!! Thank you so much for including my Dill Pickle Bites in this tasty round-up! finally some different delicious looking recipes!! Tired of the same old same old! I pinned most of these to my appetizer board. Looking forward to making these!! thank you! !